First, let’s work through the obvious: the iPhone 6s is the best iPhone Apple has ever made. There. It has been said. Apple releases a new iPhone each year and it’s always the best iPhone Apple has ever made. The company switched up its game plan a bit in 2014 and released the same phone in two different sizes, so now the title of “best iPhone ever” is shared by two devices at a time. The bottom line is if you by a new iPhone within a year of its initial release, you’re buying the best iPhone Apple has ever made. What I find most interesting about the iPhone 6s, however, is the margin by which it bests its predecessors. The new 6s looks exactly like last year’s 6, doesn’t it? Apple’s “S” upgrades are supposed to be incremental updates, aren’t they? 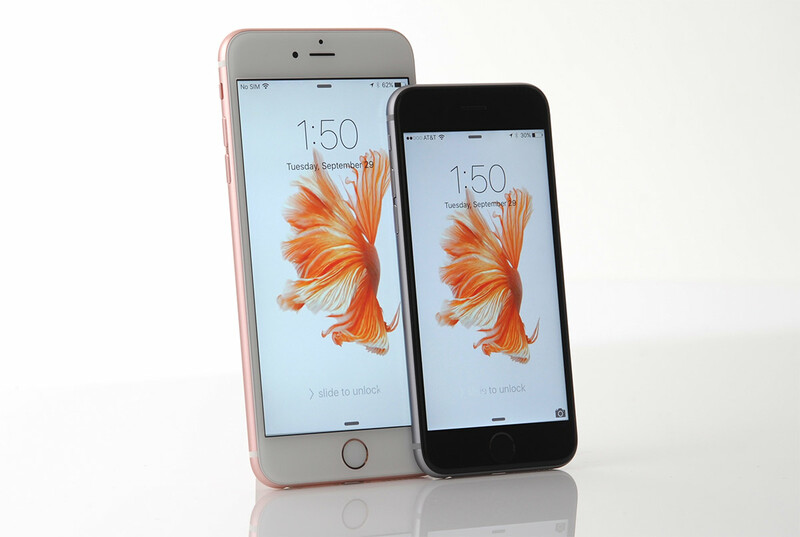 With the iPhone 6s, the face may be the same but the game has most certainly changed. Apple’s 2015 iPhone marks the biggest jump over its predecessor that Apple has ever produced. This is going to surprise plenty of people since the phone is just an “S” update, but it’s true. In nearly every measurable area where performance is concerned, the iPhone 6s isn’t just better than the iPhone 6, it crushes its predecessor (along with every other smartphone on the market); the phone is as powerful or even more powerful than several recent MacBook models. Then add on one of the most impressive smartphone cameras the world has ever seen and 3D Touch, a whole new way to interact with a smartphone, and you’re packing quite a punch into a package that measures just 5.44 x 2.64 x 0.28 inches. Each year, Apple’s new iPhones have one key feature that serves as the star of the show, and this year it’s 3D Touch. This novel new feature was five years in the making behind the scenes at Apple, as we learned from former Apple engineer Avi Cieplinski. Without getting too technical, 3D Touch is enabled by a combination of software, new hardware integrated into the display assembly, and a reinvented vibration mechanism, or “taptic engine,” that is far more precise than the vibrate motors in other phones. Together, these elements create a system that can measure the amount of pressure applied when the screen is tapped or swiped, and the phone can trigger different actions based on that pressure. The new iPhone also gives precise haptic feedback in conjunction with 3D Touch. Another big draw for this year’s iPhones are the new cameras, which have been improved both in terms of sensor size and general image quality. 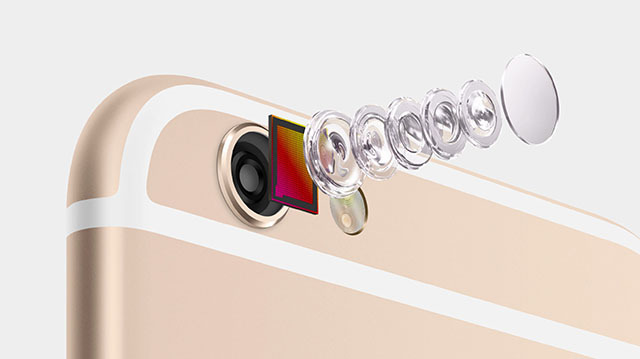 The main camera on the iPhone 6s is a new 12-megapixel unit with a five-element lens, an ƒ/2.2 aperture, a sapphire lens cover and a true tone dual-LED flash. Compared to earlier iPhones, the new camera has been improved in every conceivable way. Compared to any other popular flagship smartphone on the market, Apple’s new iPhone 6s camera is a huge leap forward. Video is also wonderfully crisp in full HD or 4K on the 6s, though I found that the jump in quality over last year’s iPhones was much greater with still images than with videos. The gap between smartphone cameras and DSLR cameras may never close entirely, but it has never been as narrow as it is right now. Around front, Apple’s FaceTime camera has received a substantial upgrade as well. The 1.3-megapixel front-facing camera has been replaced by a new 5-megapixel unit with an ƒ/2.2 aperture and a nifty new “Retina Flash” feature. This causes the phone’s screen to light up when a selfie is captured, thus illuminating the subject’s face. It works surprisingly well, though Apple isn’t the first company to use a screen as a selfie flash. Much has been made of Apple’s new Live Photos feature, which was one of the few things that Apple actually managed to keep a secret ahead of its big iPhone event earlier this month. Some dismiss it as a gimmick while others exalt Live Photos as a fantastic new feature. Reality, of course, lies somewhere in between. The new Live Photos feature is enabled by the fact that Apple’s camera app is constantly recording behind the scenes at 15 frames per second while in standard image capture mode. When the shutter button is pressed to take a still image, the iPhone 6s also saves a 3-second video alongside the photo, 1.5 seconds from before the shutter button was pressed through 1.5 seconds after it was pressed. The resulting video is saved with sound, and can be viewed at any time with a firm press on the image in the Photos app. While 3D Touch and the new upgraded cameras have stolen much of the buzz, the performance improvements baked into Apple’s new iPhone 6s are just as impressive. Last year’s iPhone 6 is often overlooked when websites discuss the most powerful smartphones on the market. But don’t let the phone’s specs on paper fool you; when you combine that snappy dual-core A8 processor and 1GB of RAM with a comparatively low-resolution 720p display and a silky smooth platform like iOS, the result is a surprisingly fast phone that topped all other flagship models last year in key performance tests. 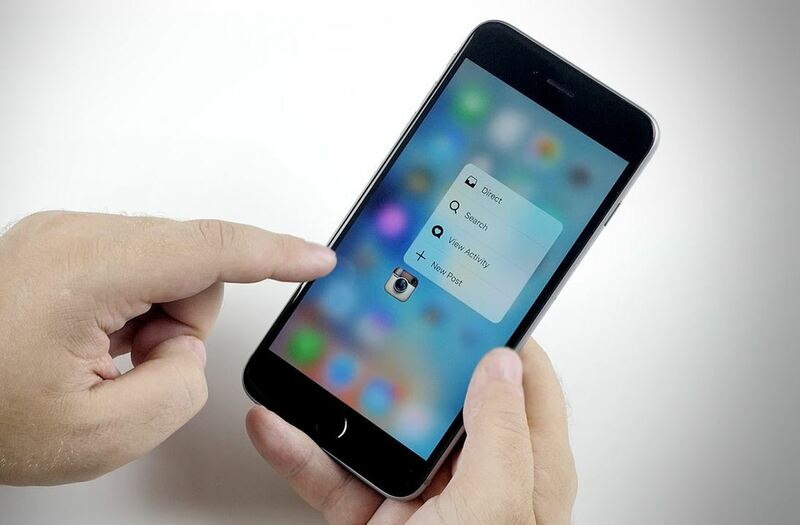 You won’t believe how fast the new iPhone 6s is. Yes, Apple’s new iPhone once again clobbers the competition in performance tests, but numbers on a screen don’t do this phone justice. Apple’s new A9 processor combines with 2GB of RAM and the new optimizations in iOS 9 to provide what is hands down the fastest and most fluid smartphone experience available today. Apps open effortlessly and transition animations are as smooth as can be. Multitasking is practically instant, which is nice now that Apple has introduced a new app-switching gesture; firmly press on the left edge of the screen and swipe inward to switch back to the last app you were using. Apps themselves are much more responsive now as well, and Apple’s next-generation Touch ID sensor has been sped up dramatically. 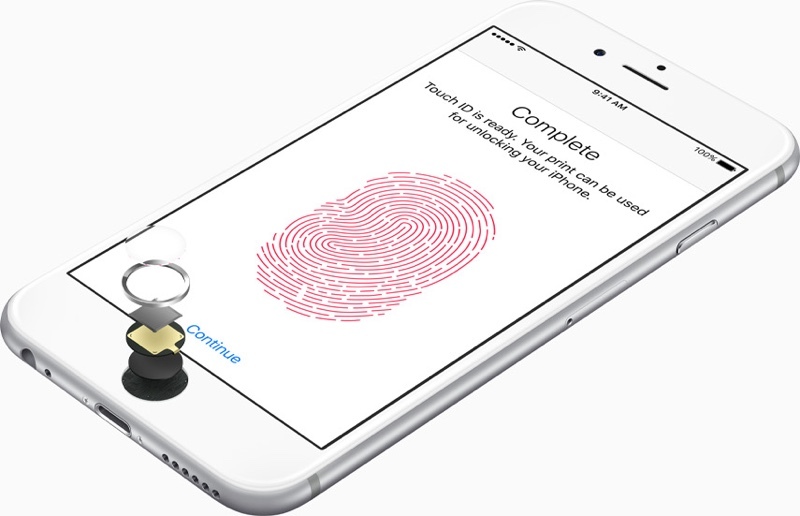 I couldn’t believe how quickly Apple’s new Touch ID sensor read my fingerprint after I first set up the phone. You can’t even really look at the lock screen anymore when you wake the phone by pressing the home button — by the time the screen turns on, it’s already unlocked and transitioning to your home screen. Apple says the new A9 chipset provides 70% faster processor speeds and 90% better graphics performance than its predecessor, but again, these are just numbers on a page. Moving from an older iPhone to the iPhone 6s, or from an Android phone to the iPhone 6s, is night and day. Of note, things have changed a bit on the outside, as well. Maybe Apple didn’t want to deal with another wave of “Bendgate,” or perhaps the company is simply always working to improve the quality of its products. Whatever the case, the housings on this year’s iPhone 6s and iPhone 6s Plus are made of a stronger aluminum than last year’s models. They look the same, but the 7000 Series aluminum Apple used for this year’s enclosures is much stronger than the metal used on the 2014 iPhones. The new handsets are also much heavier than last year’s models, though most of the added weight can be attributed to the new taptic engine and other hardware associated with 3D Touch. Of course, no smartphone is perfect, that applies to the iPhone 6s just as it does to any other phone. What a year 2015 has been for phones. Samsung’s Galaxy S6 is a tremendous feat of design and engineering, easily making it the best smartphone Samsung has ever made. The more recent Galaxy Note 5 is equally impressive. The new OnePlus 2 is a premium smartphone at a low-end price, making it a tremendous value. The same can be said of the new Moto X Pure Edition from Motorola. LG’s more recent flagship phone is fantastic, Sony debuted a great new smartphone recently, and Google just took the wraps off of its new Nexus phones. No iPhone has ever had stiffer competition than the iPhone 6s. And yet no iPhone has ever bested rival smartphones so decisively. It all boils down to the same key elements that have always made iPhones so great: design, attention to detail, and software. Apple’s iPhone 6s design is stunning and modern, the fit and finish are completely unrivaled, and iOS 9 offers a simple yet powerful and versatile user experience that cannot be matched. Add to that a third-party app ecosystem that is still superior to rival platforms, and you have the complete package. Then, take that package and make it insanely fast, silky smooth, and toss in all of the great new software features Apple has introduced with iOS 9, along with the new hardware features I just covered in this review. The result is a smartphone experience that is unmatched. They try and try and try, but there’s still only one iPhone.